Diamond Plate Anti-Fatigue Mats offers excellent durability. It is self-extinguishing tested under FMVSS-302, does not deteriorate from ozone and weathering exposure and holds up to many inorganic and organic industrial chemicals. 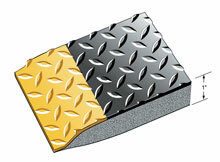 Diamond Plate Anti-Fatigue Mats are available in two thicknesses, 9/16" for higher durability in areas with high traffic and a full 1" for stations where the user will be standing for longer periods of time. 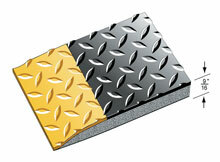 Diamond Plate Anti-Fatigue Mats are also now available with a vinyl Knob Back bottom that fully seals the resilient sponge base. 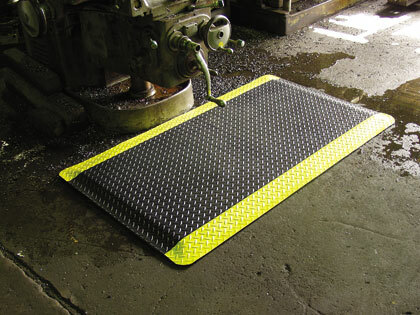 With the Knob Back, this mat will be suitable for wet area applications that previously could only use molded anti-fatigue mat products that offer marginal anti fatigue performance. Available in 9/16" or 1" sizes for standard Diamond Plate Anti-Fatigue Mat and 3/4" or 1-1/8" sizes in Diamond Plate Anti-Fatigue Knob Back Mat. Overall thickness: 9/16" and 1"
Overall thickness: 3/4" and 1-1/8"
Shipping: must ship flat. 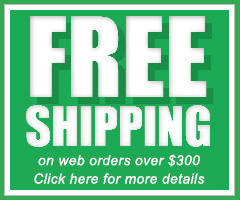 Please call or inquire for a shipping quote. Due to much higher shipping cost in comparison to matting that can ship rolled, this item does not qualify for free shipping promotions.